The Greatest Art in this world is that of loving God-to enjoy the indescribable sweetness of Divine Love in the depths of our hearts. Even the slightest taste of it can transform a crude person into a Saint. The experience of Divine Love melts all difference created by sect, creed or color, and is the fountainsource of everything good, beautiful and sublime in human society. Eager to serve aspirants here in the United States and abroad. H.H. 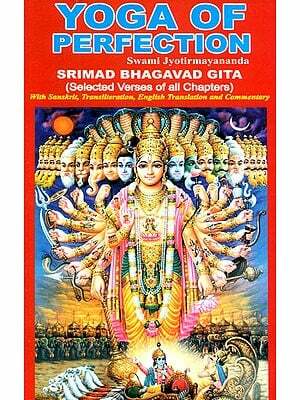 Sri Swami Jyotirmayananda brings us this classic, devotional work of Sage Narada, the Narada Bhakti Sutras. Although a number of commentaries have been offered on Narada’s teachings, the Yoga of Divine Love has a unique power all its own containing the direct insights and experiences of Swami Jyotirmayananda whose whole life attests the force of devotion in our world. The greatest art in this world is that of loving Coutu enjoy the indescribable sweetness of Divine Love in the depths of our hearts. Even the slightest taste of it can transform a crude person into a Saint, removing hatred, anger, violence, pride, passion, and all gross impurities which are at the root of every painful development in lite. Further, the experience of Divine Love melts all differences created by religious dogmas, sectarian beliefs, and prejudiced notions based on mere sentimentality, I t is the quickest, surest and easiest way to Self-realization. SwamiJyotir Maya Nanda recently recorded a series of talks at the Yoga Research Foundation 011 the Narada Bliakti Sutras that has inspired Yoga students worldwide. Those familiar with the series promptly requested a work that would contain the same inspiring essence of Bhakti .Yoga or the Yoga of Devotion. And so, eager to serve aspirants here in the United States and abroad, Swami Jyotir Maya Nanda brings us this extraordinary book, The Yoga of Divine Love—Narada Bhakti Sutras. The author of the ancient Narada Bhakti Sutras, Sage Narada, is the very personification of Divine Love, and through the centuries his teachings have inspired seekers by drawing their minds towards God. Although a number-of commentaries have been written on Narada's teachings, the present book has a unique power all its own. 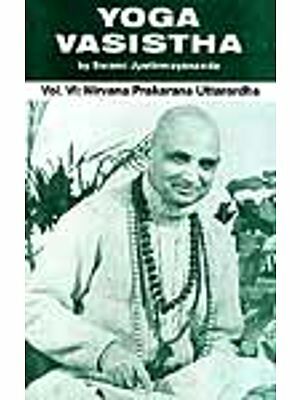 It contains the direct insights and experiences of Sri Swami Jyotir Maya Nanda, who has devoted his life to till" dissemination of Integral Yoga- the synthesis of Previously separate Yogas-in which feeling, reason, will and action are artfully blended in every evolving personality. To Swami Jyotir Maya Nanda, the ultimate in wisdom and devotion are one. That which is attained through reflection, meditation and profound enquiry into the nature of the Self is also attained through devotional practices leading to an intense love for God- devotees call it Para Bhakti (Supreme Devotion) while those on the Path of Wisdom call it Jnana (Wisdom). 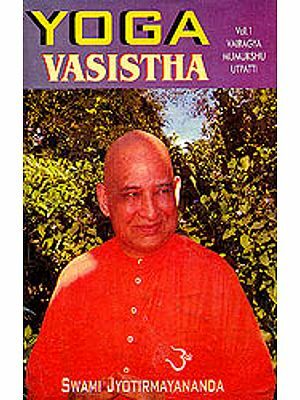 Although it is impossible for a person to develop a highly evolved reasoning faculty without elevating the feeling aspect of his personality, many Western aspirants, in their ardent pursuit of Wisdom, often make the great mistake of ignoring Bhakti (devotion). This is why Swami Jyotir Maya Nanda stresses that, ill the developing stages, Devotion and Wisdom must go hand in hand, supplementing each other, and blending with selfless service of humanity and the practice of meditation. One who has attained the sublime state of Self-realization, the goal of all paths of Yoga, becomes a fountain-source of compassion and love to all beings, and possesses a mind that has no room for hatred towards anyone or anything. This sublime work before you comes from a personality of such attainment and, therefore, brings the message of Love and Bliss to all who are eager to taste that which surpasses all human experience. Our thanks to the Ashram Stall of selfless Karma Yogis who have rendered their valuable services ill proofreading, editing, composing and producing this book. May the Sweetness of Divine Love unfold in your heart as you study this work and follow its teachings! Among the various branches of Yoga, the Path of Devotion stands as the simplest and most effective in leading the soul to the state of Liberation. Because of its importance, certain forms of devotion are included in every branch of Yoga. Jnana Yoga (the Yoga of Wisdom) enjoins Upasana (devout meditation) as a means of purifying the mind. 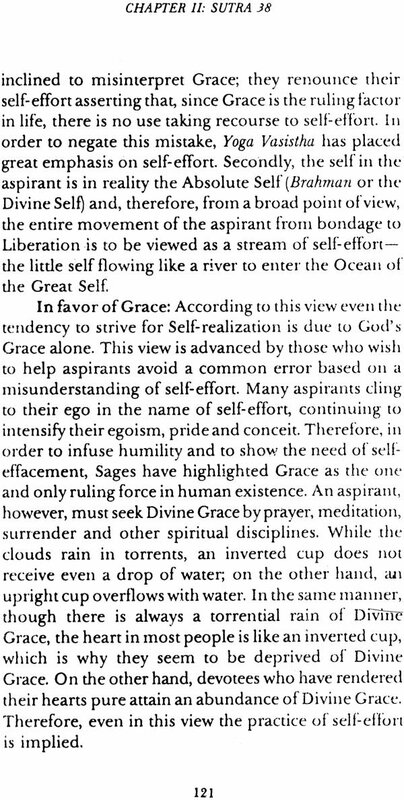 Raja Yoga considers lshwara Pranidhana (surrender to God) an effective method of attaining Samadhi (superconsciousness). In Karma Yoga, an aspirant surrenders the fruits of his actions to God, considering every action as a form of divine worship. Thus, in different forms, Bhakti (devotion) permeates every Yogic system. In these Yogic systems, however, devotion is considered a means to an end. In Bhakti Yoga (the Yoga of Devotion) devotion becomes the end as well as the means. In fact, devotion in the true sense is the consummation of all Yogas. So, no matter what aspect of Yoga is given emphasis in one's spiritual movement, in the advanced stages devotion joins in automatically. From a broad point of view, there are two types of Bhakti: Para (Supreme) and Apara (Lower). Para Bhakti is the goal, while Apara Bhakti is the disciplinary state of devotion that progresses through various stages. Para is the mature fruit of devotion, while Apara is the unripened fruit being led to its ripened sweetness. Apara Bhakti appears in two stages: the initial stage, known as Gauni Bhakti (secondary devotion), and the advanced stage, known as Mukya Bhakti (primary devotion). The latter is also known as Ragatmika (increased attachment to God) or Ekanta (one-pointed devotion). Further insight into Apara and Para Bhakti is gained through a study of the three Gunas. III secondary devotion, Rajas and Tamas are the predominating influence. 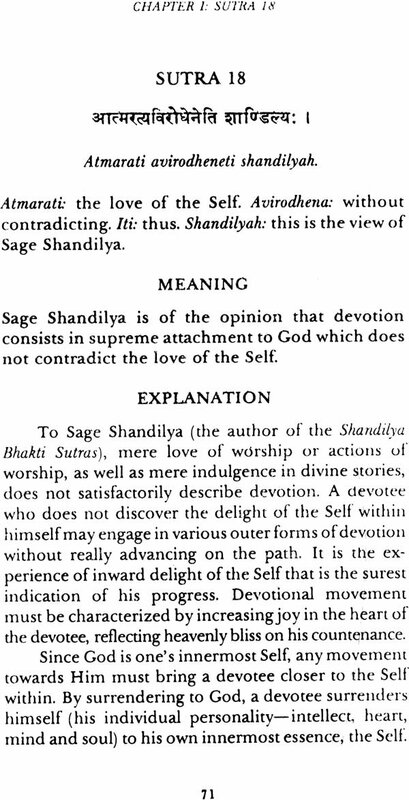 In primary devotion, Sattwa increases. 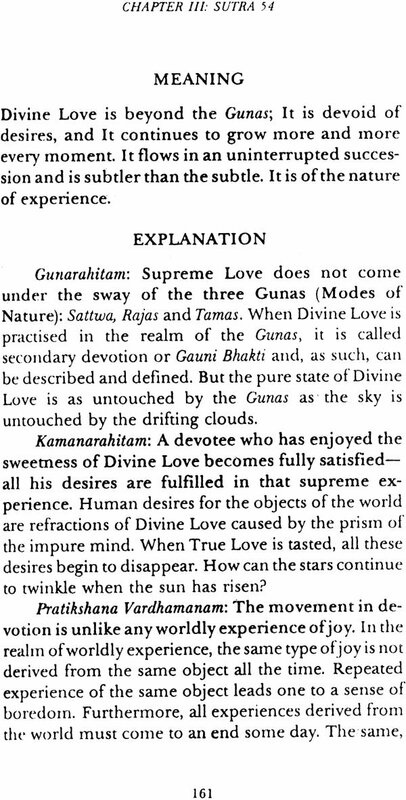 In Para Bhakti, however, all three Gunas are transcended. The Narada Bhakti Sutras consist of84 Sutras, The first 24 belong to Chapter One and deal with the various aspects of Para Bhakti, describing the nature of Supreme Devotion, the supreme joy of a devotee, and the characteristics of one who has attained perfection on the Path of Devotion. The second chapter consists of 26 Sutras (25-50). In this chapter Supreme Devotion is praised and the superiority of Bhakti Yoga over other spiritual disciplines is explained. 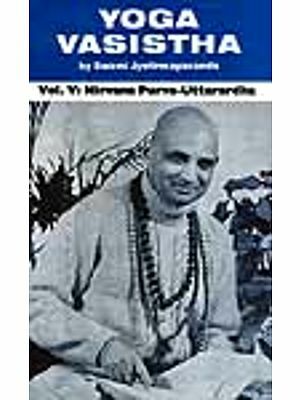 In addition it gives an outline of the disciplines and moral rules necessary for the practice of Apara Bhakti in its two stages: the initial stage (secondary devotion) and the advanced stage (primary devotion). The third chapter consists of 15 Sutras (51-65) which describe the characteristics of one who has attained the advanced level of Apara Bhakti, known as Raga Bhakti or Ragatmika Bhakti. Such a devotee becomes a Para Bhakta or Supreme Devotee automatically after reaching this stage. The fourth and concluding chapter consists of 19 Sutras (66-84) which give further insight into primary devotion and extol the glory of the final attainment (Para Bhakti).